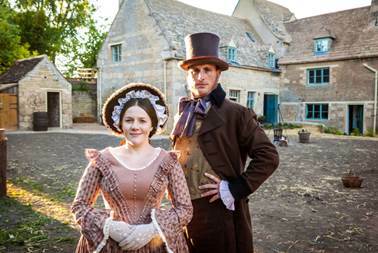 See Sacrewell Mill as you’ve never seen it before in a new series that hits BBC Two on 5 January at 8pm. In the first episode of Victorian Bakers, which was filmed at Sacrewell Mill, four professional bakers leave their businesses behind to find out how the early Victorians got their daily bread. Using ingredients and methods from the 1830s, the bakers use heritage wheat and brewers’ yeast (sourced from The Grainstore Brewery in Oakham) to make bread and cakes by hand and baked in the wood fired oven in Sacrewell’s bakery. Then as the programme explores the history of the trade and moves into the 1840s, which were plagued by poor harvests and a huge rise in the price of wheat, the bakers learn to use other grains, such as barley to bake bread. The programme was filmed just as the £1.8m restoration project to the 18th century grade II* listed watermill, which was part funded by the HLF, was completed. Mill Project Officer, Jane Harrison said: “As it was the first time the bakery was used after the project, it seemed very appropriate that it was for a programme that brought it back to life in such a traditional way. The three-part series will go on to look at other economic and industrial factors that effected the baking trade during the reign of Queen Victoria-including how the Industrial Revolution and an increase in consumerism changed the relationship between people and their food for good. Ms Harrison added: “Sacrewell is part of The William Scott Abbott Trust, a charity formed in 1964 to try and reconnect people to their food again. The way people connected with, and bought their food, changed dramatically in the late 18th and early 19th centuries and has continued to grow apart ever since.